Descubra los secretos detrás de la deliciosa cocina china en una clase de cocina de 4 horas en Chengdu. 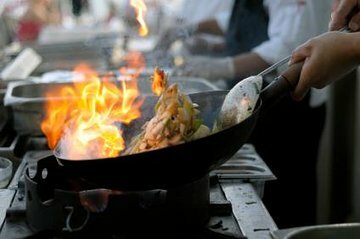 Bajo la guía de un chef profesional, aprenda las técnicas requeridas para cocinar las suntuosas comidas de Sichuan; Haga deliciosos manjares como el pollo Kung Pao y las empanadillas al vapor suaves mientras obtiene una visión de los complejos sabores de la comida de Sichuan. Después de preparar una tormenta en la cocina, siéntese para deleitarse con los frutos de su trabajo con sus compañeros amantes de la comida. Regrese a casa con las tarjetas de recetas para impresionar a amigos y familiares con su nuevo conocimiento. Curso de cocina de 4 horas en Sichuan con chef profesional. Aprende sobre las especias de Sichuan y las técnicas de cocina. Disfruta de los platos que preparaste y llévate a casa las recetas. Elección del almuerzo o la cena. Salga de su hotel de Chengdu con su guía experimentado y aventúrese a la escuela de cocina establecida. Entra y ponte el sombrero de tu chef para comenzar a aprender las técnicas detrás de la deliciosa cocina de Sichuan. Escuche mientras su chef profesional explica las complejas combinaciones de sabores y las especias sutiles que se utilizan para crear especialidades locales y luego comience a preparar cuatro platos tradicionales chinos. Aspire los aromas tentadores mientras cocina platos como el pollo Kung Pao, el cerdo agridulce, la berenjena con sabor a pescado y las albóndigas al vapor suaves. Pregunte con anticipación si desea cocinar un plato de su propia elección. Después de trabajar en el calor de la cocina, agregue los toques finales a su festín chino y luego siéntese para devorar sus platos. Converse con sus compañeros amantes de la comida en el ambiente relajado de la escuela de cocina y luego salga con las tarjetas de recetas para asegurarse de recordar las recetas recién aprendidas. Regrese a su hotel con su guía experto al final del recorrido. The small kitchen was perfect for a morning class of 2. Instructions were confined to sweet and sour chicken, kung pow chicken, pork and shrimp dumplings and bean curd in XO sauce. The teacher demonstrated and we each repeated the steps of prepping the ingredients and the sequential combining and cooking them, and eating them. We were stuffed. This was good for developing some skills cutting everything with a small cleaver and cooking everything quickly in a very hot wok. The cooking class was very basic. Food was good and we cooked four dishes. The cook spoke hardly English and was not able to provide any background information on Chinese cooking. The cooking class was in a kitchen of a Hostel. The woman spoke only a little English but was very nice. We made 3 recipes and got to take English versions with us to make at home. The food was very good. Overall a very nice experience. It was perfect! I was picked up promptly in a private van and taken to the kitchen for my class. It happened that I was the only one there that day so it was a private lesson. Every question I asked was answered and was given tips as I went along. Very enjoyable and tasty too. Got to take my food back to the hotel for my son and daughter-in-law to enjoy. She is Chinese and said it was some of the best she had tasted! The whole experience was great. Would highly recommend it to anyone who enjoys cooking and food. Cooking class was very easy to follow and I am confident that I will be able to replicate dishes once I am back home. My boyfriend and I booked this about a day in advance. Samtours was quick to respond about arranging hotel pickup. The taxi driver was ontime and dropped us off at Holly's Hostel, which is close to Wuhouci and the Jinli walking street area. Some of the ingredients like tofu and green onions were pre-chopped and the garlic and ginger had already been peeled which made the cooking go fast. I took notes on the preparation and recipe as the instructor lead us through them. Each one took 15-20 minutes for the two of us to prepare and were delicious. We made mapo doufu, sweet and sour pork, kungpao chicken, and dumplings. The mapo dofu was my favorite and the sweet and sour pork was my bf's favorite. 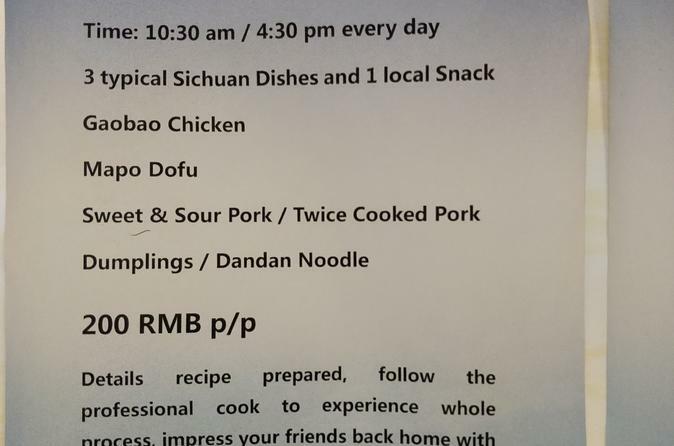 Looking at the hostel menu, we could have ordered these for about 100 RMB, but I definitely intend to make all of these again and the recipes are pretty simple and easy to follow, so I thought the tour was money well spent. We were done around noon this was the lunch session. This cooking trip was run by Samtour and it couldn't have gone better. I was picked up at my hotel right on time and the Chef/driver spoke perfect english. His home was much nicer than mine and he made me feel very comfortable. We cooked mapo tofu, kung pao chicken, and twice cooked pork... All very delicious. I will definitely use him in the future. Highly recommended. our group was just the two of us, so the cooking class was at the chef his home. Could not want a better experience, Easy cooking directions and recipes. Hands on experience. Food as good as any I have had at restaurants. In fact I made one of the dishes almost immediately on my return home.